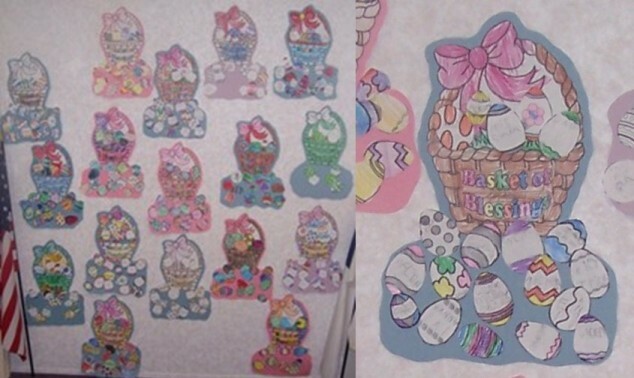 Want to piece together an Easter bulletin board? This Easter bulletin board has been a favorite for the last couple of years. You can do it all using clipart and coloring or spruce it up with glitter, glue and sequins. As a matter of fact you can even take this idea further, which I’ll explain later on. Using a computer type out ‘Basket of Blessings’ using whatever font you like. If you can, use a shaped text to give it a little oomph. If you found enough, put around 10 different kinds of eggs on one sheet. On each egg (to make it easier) you may want to put a rectangle to write their blessing in. Make enough copies of each paper and have the students decorate them. After their blessing has been put on the egg and the eggs decorated they can be cut out. The decorated basket also needs to be cut out on the outside edges. Glue the basket on a large sheet of construction paper. Glue some of the eggs ‘in’ the basket and some around the bottom. (pictures below) After the glue dries trim around the eggs and basket. Put their blessings in plastic eggs (or using a marker write on them), put the eggs in a basket that they decorated with ribbons, bows, buttons, etc. with grass optional. Make a card with ‘to and from’ on it if the basket is a gift for someone. Leave the Easter bulletin board page and return to the holiday page.